Quick, tell us: How many laptops are in your middle schools? Which ones are about to come off warranty? Did your tech department finish updating all the software licensing? If you can’t answer these questions, it is probably time to look into asset-management software. These programs let you view, at a glance, the products on your network. Some even allow you to remotely control PCs, communicate with users, and stop students from visiting inappropriate Web sites. To find the right solution for your district, read on. Pricing based on district size; includes unlimited users and support. Why did your district decide to get this? “I’m in charge of software licensing,” says Ginny Wexler, network manager, “and I feared being audited.” Knowing she was out of compliance in terms of licensing propelled Wexler to find a way to better keep track of her equipment and software. She didn’t know where anything was, some laptops were lost, and each building had individual inventory lists. How did you choose the package you have? Wexler saw one product that cost $40,000, plus hardware, which was prohibitive. She went to a SchoolDude demo and found ITAMDirect, which provided everything she needed at an “unbelievable” price point and did not require her to own a server. Customer support, says Wexler. “When you pick up the phone and call, you get a person. They call and check on me, ask if we need training, and more. It’s incredible.” Wexler also likes knowing which software is installed on each machine. “I didn’t have a clue before; now it’s concrete.” And it helps her to be aware of her system’s deficits, such as switches that were flopped out and never renamed. What would you change, if possible? “The teachers are definitely not loving me, but I’m not here to make friends,” says Wexler. “I’m here to keep the networking running.” Also, the search features are not always where she would like them to be. Was it easy to learn to use? Have you saved money or time? The education-services department has been trying to regulate classroom technology, says Michelle Benham, technical services supervisor. “Instead of a computer lab, they want six computers in each class as well as flexibility for individual and group projects.” In addition, the district had begun buying laptops, so it had to track them and manage theft protection. 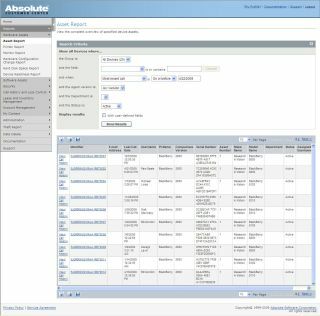 The inclusion of theft protection made Absolute’s product stand out from others. One thing that has been a bit problematic, says Benham, is that Computrace is hard to remove from a computer. “The agent works in the bios and, once online, reaches out to the Computrace Web site to download software without the user knowing.” Although that’s what lets her recover missing laptops, the product is sometimes deployed in places she doesn’t want it to be. “It’s more of a housekeeping thing,” she says. Benham has recovered more than 90 percent of the stolen laptops, something she says would never have happened without this software. She also saves time because she doesn’t have to look for misplaced computers; and even better, when she upgraded operating systems, she knew which machines were done and which weren’t. Another plus is that it has GSX (global service exchange) with Apple, which lets Halvorson see purchase dates and warranty expiration for all her Apple products. Extremely, she says. “In addition to direct support from JAMF, there is a community of users who share ideas and solutions. There is a mailing list with sometimes daily postings, and lots of education and higher-ed types are using it.” The company also offers weekly demos and a resource tool kit. Halvorson says she has saved time, although it’s hard to quantify. When the state’s technology task force asked everyone to fill out a comprehensive survey on technology tools, Halvorson gathered the information in one afternoon. Without Casper, it would have taken several days. The special-education and special-programs departments wanted to keep track of inventory, including curriculum, equipment, and adaptive technology, says Janis Barton, director of technology, telecommunications, and AV services. The departments were losing equipment and loaning products to other districts, and they needed a procedure for checking out equipment properly. The district already used Follett products and liked them, Barton says, so it checked out Asset Manager and was happy with its performance. Yes, says Barton, but end users who know nothing about enterprise-level systems should first be allowed to spend time with a library-media specialist. Although she hasn’t tracked it, Barton knows she has saved both time and money, because in the past, when a special-needs student needed a specific product and it wasn’t available, she had to buy it. Now she can track it down. READS Collaborative & R.E.A.D.S., Inc.
Pricing starts at $2,551 but varies based on quantity and functionality. Pavao researched the available products online, and EMS had all she wanted, along with some extras that “made me happy”; it was the package that best suited her needs. “I get up to 100 calls a day: ‘I’m having a problem,’ ‘I can’t do this.’ I no longer have to drive to another building. I can just look at my desk and talk them through it. That saves me more time than I could ever compute.” In addition, she doesn’t have to do inventory by hand. “I love this!” Pavao says. Altiris Asset Management Solution lets users manage hardware and software products, including contractual and financial data. K2 (KeyAuditor & KeyServer) is an asset-management suite from Sassafras Software, Inc. It can be used to conduct enterprise-wide audits, track IT assets, and run usage reports. KACE’s KBOX Systems Management Appliance offers an Asset Management add-on so schools can track IT products from purchase to pasture. TAKE Supply Chain’s asset tracking and maintenance solution is a Web-based, mobile application that automates asset-data collection and improves tracking, visibility, and reporting of fixed, capital, and physical assets.